many thanks for Task 31. Below you can find my response and below that the instructions for Task 32. You asked me to develop an installation that captures the research I am currently undertaking. That got me thinking: what is the research I am actually doing? Yes, I am writing a book for nearly two years now and I am doing research as part of this. But is this my research? It feels to me that my research is a lot less defined; something I have been involved in all along and still remains inchoate and without a name. Yes, it involves writing and performance making and practising yoga, and dancing but is neither of these things alone nor all of these things together. In a way these practices feel incidental to something more urgent, more fundamental. In some ways, this project feels part and parcel of this ‘research’. Employ an interdisciplinary methodology, play at and with boundaries, and sharpen a practice of yoga that has been nourished for so long and now at long last it feels available to me, serving me at every turn of the yellow brick road. What you will see below is a game/installation I played with a group of second-year theatre and performance students at the University of Leeds. It is informed by an exercise by American choreographer Susan Redhorst and described in her book A Choreographic Mind (2015). Redhorst’s exercise is simple: in a pair you choose a set of objects, and you take turns arranging them in a space marked between you. I love playing this game, and every time I invite others to play it with me it is totally absorbing. In the beginning I thought of it as a way to develop compositional skills, but as I went along I realised it also exercises responsiveness, imagination, new ways of seeing, and an appreciation of affordances. More importantly, the exercise is extremely gratifying but without being competitive or strenuous; maybe because it develops a sense of co-presence between human as well as non-human partners in a situation that continues to unfold. 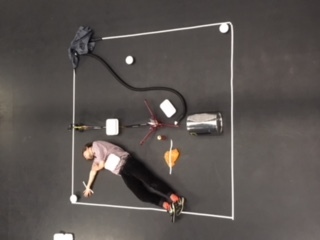 So Redhorst’s exercise formed the basis of a piece that a group of students were creating for a larger performance that took place at the Leeds Art Gallery in May 2018. Their piece, called Re-arrange’ was a response to Anne Hardy‘s installation Falling and Walking (phhhhhhhhhhh phossshhhhh crrhhhhzzz mn huaooogh) that was shown at the Gallery during the same time. Responding to Hardy’s piece, which used made and found debris to create an installation the visitor could walk in, ‘Re-arrange’ similarly used mundane objects. Unlike Hardy’s piece, though, the visitors at ‘Re-arrange’ were invited to move and position the objects in the space. Also, unlike Hardy’s piece that had a prerecorded soundtrack of found sounds that marked the duration of the installation, the objects used in ‘Re-arrange’ could produce two types of sound: natural sounds generated out of the object’s material and movement and recorded sounds that were generated by sensors located in the objects, which responded to the visitor’s movements (at around 2:50 of the video you can see both sounds working together). The video captures an impromptu play that took place, when we were testing ‘Re-arrange’ prior to its installation in the Gallery. I consider this to express my research as articulately as it can get (which is not very much): my research is the process that unfolds between people as they engage in a creative exploration, which has neither a pre-determined shape nor expected results, and seek to relate with whatever reveals itself to be on offer. Players are: Ed Coulden, Jacob Justice, Joe Kent-Walters and myself. Video by creative technologist Christine Farion. On day 1, decide on the spot and say ‘this is the moment I will take a breath’. Wherever you are, close your eyes and take one breath. Try to inhabit and be present to this one breath as best you can. On Day 2, do the same but take 2 breaths instead. Increase one breath per day until you get to 5 breaths. You can do this anytime of the day at any place, and it should not be planned in advance. Bring back to the Blog traces of what happened.